Stuart MacBride was born in Dumbarton, Scotland and raised in Aberdeen. His careers include scrubbing toilets offshore, graphic design, web design and IT/computer programming. 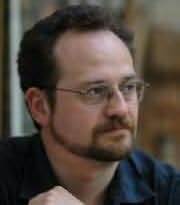 Stuart MacBride, without the ‘B’, is the bestselling author of a series of crime novels featuring DS Logan McRae and set in Aberdeen. He won the International Thriller Writers best debut novel award, and has been shortlisted for the Barry Award, and twice for the Theakston’s Old Peculier Crime Novel of the Year award. In 2007 he won the Dagger in the Library, awarded for a body of work, and in 2008 he won the ITV3 Crime Thriller Award for Breakthrough Author. Halfhead, published under the name Stuart B MacBride, is his first foray into Science Fiction. Stuart lives in North East Scotland with his wife Fiona, cat Grendel, and a vegetable plot full of weeds. "By far the most fun I've had reading a novel in a long time."